Police detectives in Lagos have recovered the picture of an unknown boy who was slaughtered and cut in parts for money rituals after the suspects behind the cruel act were arrested with the human parts. It was gathered that three suspects have so far been arrested and detained at the SCIID, Lagos in connection with the dastardly act. The suspects were Mrs. Folade Folake, Mary Iwinkunle, 30 and Gbenga Fadele believed to be a native doctor who requested for the victim’s blood for money rituals. The police arrested the suspects and intercepted human parts inside a bag at Cele Nizer area along Aiyetoro Badagry expressway, Lagos, PM Express reports. It was gathered that when police detectives searched the bag Folake was carrying, it was discovered that it contained human parts and assorted charms. She was then arrested and detained by the police detectives while the parts were recovered as exhibits and transferred to SCIID for further investigation. During the investigation, the photograph of the boy said to have been murdered was recovered but the details of the boy was not known. Mary Iwinkunle and Gbenga Fadele were mentioned by Folake as accomplices and Gbenga was arrested. They were later charged before the Ebute Metta Magistrates court for murder. 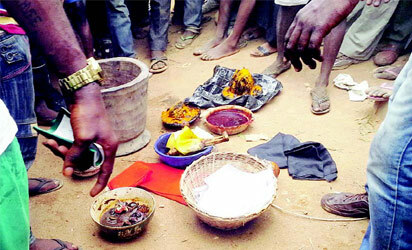 When they were arraigned, the prosecutor, Inspector Bayo, informed the court that it was a clear case of murder for ritual purposes because the cut parts and charms were recovered from the defendants. Thus, the Presiding Magistrate, Mr. O.O. Olatunji, did not take their plea and ordered them to be remanded in prison custody. The court directed the prosecutor to duplicate the file and send to DPP for advice. It was gathered that the case may be transferred to the High Court which has the higher jurisdiction to try murder cases.